This is a Flashcard Tower. I picked up the idea from this blog. 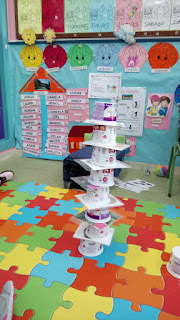 Kids have fun building it up, and it is good as well to practice and review vocabulary! All you need is some yoghurt containers and some flashcards; never forget it, keep calm! Hemos empezado a trabajar con las NN.TT. jugando a Kahoot. El próximo día probaremos con la historia de Wolfy.